Welcome to my Pune series. At first glance the effigy appears to be merely an oversized kindly Ganpati, Maharasthra’s most loved god, and the remover of obstacles. Covered in 8 kilograms of gold, and insured to the tune of US$150,000, the Ganpati is a devotee’s gift to the city and birthplace of the annual Ganeshotsav [Ganesh festival]. Back in the late-1800s, there was once a wealthy sweetmeat seller [halwai] in Pune called Dagdusheth who lost his son to the plague epidemic. To overcome his grief, his guru advised him to build a temple dedicated to the ancient elephant-headed Hindu god Ganesh, also known as Ganpati. Completed in 1893, the result is what you see. The original sweetmeat shop still stands, now under the name Kaka Halwai near Datta Mandir. Lokmanya Tilak, the Indian nationalist leader, was a close friend of Dagdusheth. It is said that Tilak got his brainwave to have an 11 day Ganeshotsav as a way of getting around the British Raj order that banned public meetings and at the same time spur patriotic sentiments as well, right here. The rest is history. We, as a free nation, are this year 70 years old. The Ganpati festival is a landmark event in the country, celebrated with maximised grandeur in Maharashtra and the city of dreams, Mumbai. This entry was posted in Exploring India, Global Travel Shot, Maharashtra and tagged 36 Hours in Pune, Bal Gangadhar Tilak, Dagdusheth Ganpati, Ganesh Chaturthi, Ganeshotsav, Lokmanya Tilak, Things to do in Pune by Rama Arya. Bookmark the permalink. very nice piece Rama! 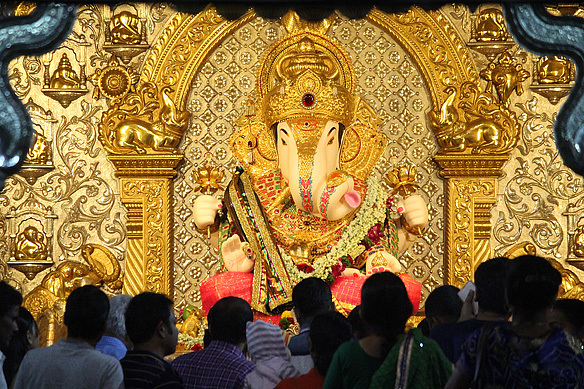 A yearly visit to Dagdusheth Halwai Ganpati revisited through your piece. Glad you enjoyed the post, Ian Cross. Pune is a little treasure box of heritage and stories! Thank you for stopping by and your lovely comment, travelkath. 🙂 Appreciated. Great travel story! Might go to Pune in the coming months so enjoyed the review! Glad you enjoyed the read, lnptrippin. 🙂 Thank you for stopping by.